Look out for those killer combos. Like Artifact's sister game, Dota, you're asked to try to forge a win out of the pieces available to you in a given moment. There are certainly high and low-tier heroes and cards, but there's sufficient depth to this system that you can't rely on them winning games for you. As such, this guide is going to take the form of advice rather than strict instructions—these are tips that I've found helpful while learning the game, rather than definitive lists of the best stuff. This guide assumes that you've played a little Artifact already and you're familiar with the fundamentals. It’s easy to fixate on your heroes. They are frequently your most powerful units in a given lane and almost always the most important. Without a hero present in a lane you can’t play cards of their colour. You’ll buff them, upgrade them with items, and generally rely on them to win the game for you. But here’s the thing: they’re going to die, and you’re not always going to be able to do something about it. In the most brutal case, you might lose your heroes as soon as the first cards are dealt onto the board: because while you can control which three heroes come out first, you can’t control which lane they go to or what they’re matched against. Several red and black heroes—notably Axe, Bristleback, Ursa, Legion Commander, Bounty Hunter and Phantom Assassin—can reliably one-shot some heroes at the beginning of the game. Blue heroes are particularly vulnerable to this. When this happens, particularly when you’re first learning the game, it can be really disheartening. While you wait for a given hero to respawn, your ability to make plays and participate in the game is reduced. Your opponent is often given free reign for a turn—it’s a bad feeling! This is the important thing to remember in those moments: being able to redeploy a hero to a different lane is one of the most powerful options in Artifact—there’s a reason there’s a shop item dedicated to the purpose (see also: ‘Town Portal Scrolls are good, though’.) If you lose a hero to an unlucky flop or uncounterable play, you’re also gaining some control a little further down the line. For exactly the same reason, it’s not enough to simply slay enemy heroes whenever you get the chance (or celebrate when the flop goes your way.) Heroes die in Artifact, but they also come back: it's on you to decide which poses the bigger threat. 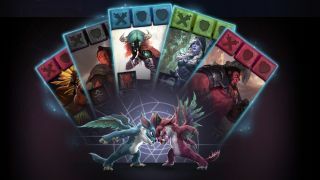 Artifact sets itself apart from most card games by effectively giving each player several health pools. It can be disconcerting, if you're arriving from a game where you have a single pool of life, to see how quickly an individual lane's tower can fall. Try to move past the urge to defend every tower unless you have a deck that is specifically designed to do so, and that can turn doing so into a win. Often, trying too hard to defend where you're weak prevents you from maximising your impact where you're strong. Remember: you need to win two lanes, not three. When big mana cards start appearing, Artifact stops messing around. Every color has ways to initiate combos that can feel absolutely unstoppable, and they’re all different. Against red, expect to see a lane stacked with enemy heroes suddenly turn lethal thanks to the uber-buff Time of Triumph. Against blue, expect infinite mana combos triggered by Incarnation of Selemene and Aghanim’s Sanctum. Against green, expect a lane of otherwise-ordinary creeps to turn into utter monsters thanks to Emissary of the Quorum. Against black, expect Steam Cannons to start making a mess of neighbouring lanes while Assassinate devastates your best-defended heroes. These are just a few examples. They’ll all make you sad the first time they happen, and it can feel worse if it happens because of cards that you don’t have yet. They can all be anticipated and countered—you just need to learn the tells. A single enemy blue hero drops into a lane where you have a huge advantage. Look out—Annihilation is coming. This spell kills every unit in play regardless of their health value, and is one of the best ways for a blue deck to safeguard against the kind of buff/rush strategy that red and green decks specialise in. If the enemy player has initiative going in to that turn, it may already be over for you in that lane. If they don't, sound the red alert. Kill, stun or silence that blue hero if you can. Otherwise, hope your best heroes already have Blink Daggers—or be grateful that you're carrying a Town Portal Scroll. If you're playing green, the Cheating Death improvement can be a powerful counter too. It's Time of Triumph o'clock! This spell gives every hero in a lane +4 to everything, including special keywords like Armor, Retribution and Siege. It's a game-ender, potentially, unless you've already got stacked defenses. Annihilation is a decent answer to this, but it'll result in all the buffed heroes respawning at the same time which might not help much unless you're in a position to win within the next turn. Phantom Assassin's signature card Coup de Grace can also take out buffed heroes with ease, and allows you to specifically target unblocked heroes—this is often the best option. Bolt of Damocles costs ten mana, but it does 20 damage to a tower. From this point onwards, you have to treat each of your sub-20 health towers as if they're in lethal danger if they're in the same lane as a blue hero. Once again: stun, silence, slay before they can do it. Your opponent is building a ramp and they're about to do some sick skateboard tricks off the top of it. By 'skateboard tricks', I mean 'massively accelerate their mana curve and throw at least one dinosaur at you.' Letting your opponent simply play as many cards as they want at this point can be devastating, but the setup is pretty obvious. This is a great time for Drow Ranger's silencing signature, Gust. Failing that, punch those wizards in the face and skip to the combat phase with Enough Magic! And if you have any way to destroy lane improvements, now's the time. Speaking of lane improvements: they're really good. Every colour has access to some strong ones, although red's are probably the least impactful. Black tends to use them to generate gold and then, later, deal damage. Sorla Khan's Assault Ladders are an exception, enabling horrifying early-game tower rushes if used correctly. Blue has access to damaging improvements early, particularly Ogre Magi's signature, Ignite, and powerful mana regeneration from Aghanim's Sanctum. Green has some of the best, gaining card draw from Unearthed Secrets and unit damage from Mist of Avernus (among many others.) You need a plan for them, which basically comes down to 'take cards which destroy them' or 'win the game before they make the game unwinnable for you.' By way of balance, red decks have access to the best anti-improvement cards, especially Smash Their Defenses! Smash is cheap, reliable, and—better yet—triggers a card draw. For this reason, don't rush to play your best improvements to a lane with a red hero in it, even early in the game. This is probably the most important piece of advice in this guide, so I'm hiding it in the middle to make sure you're still paying attention. So many different kinds of Artifact play and counter-play depend on going first in a lane. For that reason, passing even when you've got cards you could play is frequently the right call. This can be hard for new players to wrap their heads around, particularly if you're used to single-board card games where using a big spell to take out a nasty enemy is almost always the right decision. That's sometimes the case in Artifact, but sometimes it's greedy and unnecessary: it's often worth passing in a lane where you're pretty secure in order to gain initiative in lanes where you're not. Likewise, 'Get initiative' cards are great because they give you a way to safeguard against opposing initiative plays (this is also one of green's big weaknesses, as it happens.) Arcane Assault and Hipfire are staples of blue and black decks respectively for this reason, and it's often worth holding onto them for initiative emergencies. The 'Get initiative' effect on Kraken Shell is also why Tidehunter is a big special boy. Then the shopping phase begins, it’s tempting to dump your available gold into whatever you can afford—usually this’ll mean consumables from the right-hand deck. This isn’t always the right play. You need to pay attention to the 'curve' of your item deck in the same way you would the curve of your main deck—except in this case gold stands in for mana, and you can't always predict how much gold you'll pull out of any given turn. With that mind, different decks want to spend different amounts at different times. Your aggressive red heroes might get mileage out of regular healing through consumables, but black decks—with their reliable ways to kill heroes and multiply their gold—might want to be more ambitious and hold off for bigger buys, like Horn of the Alpha or Nyctasha's Guard. That said, some of the most important items in Artifact's basic card set fall in the middle of the cost curve. Claszureme Hourglass and Blink Dagger are both very potent and relatively cheap; Vesture of the Tyrant can also have an incredible impact and you'll be able to buy it a little earlier than the game's flashier endgame items. sometimes a game will come down to whether or not you remembered to buy a Town Portal Scroll. Initially easy to overlook in favour of more obviously important consumable effects like healing and card draw, the ability to send a hero back to the fountain to return next turn is very potent. It lets you rearrange your lanes to counter enemy combos or set up your own, and can remove a hero from danger at a key moment. In short: TP scrolls are almost always worth the gold. There are a lot of variables in play in any given game of Artifact—some of which you can control, and some of which you must react to. At the start of each round, each player gains two basic creeps which are distributed to random lanes. Sometimes they'll both go to the same one, and at other times they'll split up. When you start playing, you might not fully appreciate how important this is. Units are placed in front of unblocked enemies unless there's nowhere else for them to go. This means that if a creep is about to head to a lane with a single enemy hero in it, it will definitely stand in front of that hero. However, if there are more units heading to a lane than there are enemy units in a lane, then the exact position of each unit is randomised. If you choose to deploy a hero to the lane described above, then there is a 50/50 chance that your creep will end up in front of the enemy hero. This can have huge implications for the board state that follows. Basically, don't plan too far ahead: you might have a great combo in mind going into a new turn, but respect the fact that the board state is always in motion. As an aside, the blue hero Kanna is powerful precisely because she locks down this part of the game—friendly creeps will always join her lane. Bear in mind that this makes the game more predictable for your opponent, too. Also like Dota, learning to manage your mood is how you learn to make better decisions. Artifact has some really nasty cards and combos tucked away in its depths, and occasionally its many randomised elements are going to conspire to crush you. It's just going to happen. In those moments, don't ragequit. Play out the game, and thank back to the last decision you made that could have altered the outcome. That's the only thing that matters, at the end of the day: the stuff you can control.